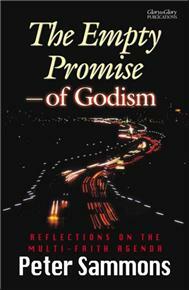 PETER SAMMONS is a Christian writer and business consultant. He is the author of The Birth of Christ (Glory to Glory, 2006). Many who may talk about 'God' or 'god' today are seeking to promote a multi-faith position, embracing what they take to be the essence of the world religions. Some of those adopting this new form of syncretism even claim to be Christians. Bible believers are right to be concerned about this development because the 'promise' apparently held out by proponents of this position is an empty and misleading one. Peter Sammons compares claims of the multi-faith 'godists' with the claims of the authentic gospel, and shows why they are irreconcilable. He exposes the incoherence of the multi-faith approach. What is Godism? For answers to this and lots of other questions download this Frequently Asked Questions document written by the author of the book. This is a book for all Christians concerned about the impact of the multi-faith tendencies which are taking root in modern life and thought; it is also for non-Christians who are seeking God, providing clear guidance on authentic, biblical Christian faith. This book was reviewed in the British Church Newspaper. Read the review here. It was also reviewed on Prophecy Today UK.